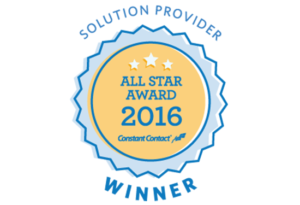 For the second year in a row, EVH Marketing, a marketing consulting agency, has been named a 2016 Solution Provider All Star Award winner by Constant Contact, part of the Endurance International Group, Inc.’s family of brands and the trusted marketing advisor to hundreds of thousands of small organizations worldwide. The annual award recognizes the most successful 10 percent of Constant Contact’s customer and Solution Provider base, based on their significant achievements using email marketing to engage their customer base and drive results for their organization during the prior year. Constant Contact, an Endurance International Group company and a leader in email marketing since 1995, provides hundreds of thousands of small businesses around the world with the online marketing tools, resources, and personalized coaching they need to grow their business. For more information, visit: Constant Contact.